Every now and then our body tells us we need to slow down and take an additional rest day and that is perfectly ok! There are several physiological as well as psychological reasons why we should schedule regular rest days. Here are few great reasons why it’s so important, and why you shouldn’t beat yourself up if you have to take an extra day here and there if you’re body is begging for it. When we engage in strenuous physical activity our muscles break down. It’s during that time that our muscles repair themselves, becoming stronger and more efficient. Your muscles need that time to rebuild, without it they will continue to tear. This continuous break down of your muscles leads to several issues (as stated below) but most importantly it will negatively effect the improvements to your strength you are working so hard for. This is also why it is important not to train the same muscle groups on consecutive days (when it comes to weight lifting). So when it comes to cross training, be sure to alternate your strength training days and do not neglect the importance of a rest day! We exercise so that can look good, be stronger but more importantly to feel good. Exercise, along with proper nutrition and sleep, help boost our energy levels and our mood. But there is such thing as too much of a good thing. When we over-train and neglect rest, our bodies become fatigued. This causes us to lose energy, have trouble sleeping and it even effects our mood. It becomes a vicious cycle because when we are fatigued, we will not have the energy to workout. Without the energy to workout, we will not meet our goals and of course our mood will be negatively effected by that as well. Listen to your body, take rest days and your body will thank you for it with the energy it needs to keep going in the gym, out on the trail and in life! Your mind can get just as burnt out as your body. Life is all about balance. We have to be able to physically and mentally enjoy what we do otherwise it will soon feel more like a daunting task than enjoyable activity. Taking proper rest not only helps you physically, but emotionally as well. It helps prevent boredom, rekindle your hunger for exercise (you know you miss it when it’s gone ;-)), and of course recharge your psyche. Not to mention when you are physically tired, your brain cannot function at full capacity, so rest days are win-win for body and mind. Over-training has been known to weaken your immune system, making you more susceptible to fatigue and illness. When you engage in consistent strenuous activity, your body’s immune system is there to help make the necessary repairs to your muscles and joints. Without proper rest, your immune system can not keep up with the demands you are putting on your body. Without an efficient immune system, you are more likely to become ill and then you will have no choice but to take additional rest days to re-cooperate. Do not wait until you’re already sick to take rest days, be sure to take them weekly in order to prevent a hit to your immune system. From running to weight lifting, and everything in between, rest days help prevent the overuse of muscles and joints. Without allowing the proper rest, this overuse will eventually make you more susceptible to injury. There is only so much our muscles and joints can take at any given time before they begin to wear down. It is important you not only allow yourself regularly scheduled rest days, but also that you are listening to your body when it is telling you that you have had enough. Pushing ourselves through extreme fatigue and pain will only set us back in the long run because we will become injured and, of course, have no choice but to rest then, whether we like it or not. The key to rest days is to schedule them in your regular workout routine. Chose a day of the week where it will fit best and commit to it. If an opportunity arises for a race, workout or strenuous physical activity, plan in advance and reschedule your rest day, but don’t skip it that week. Also, it is tremendously important that you listen to your body. Some times it will be begging you to slow down and take an extra day or two of rest. Trust me here, a few days off will certainly not set you back in your goals. In fact, the much needed rest will have you coming back stronger than before and ready to go out and crush it! Greetings, Coach Christina here and I’m in the final countdown for marathon number 5 which means full out taper madness! I am by no means a pro at this, even with 4 full marathons, several half marathons, countless mid-distance races and even a few triathlons under my belt, but I have certainly become much more comfortable and confident in the days leading up the the big event. Don’t get me wrong, the nerves still can get the best of me, but fortunately not quite as bad as they did in the past. This of course, is thanks to experience as well as becoming more proficient at tapering. Having learned from my mistakes as well as kept what I found to have been successful, I am continually getting more and more relaxed and ready for the race rather than freaked out like I often did in the past. 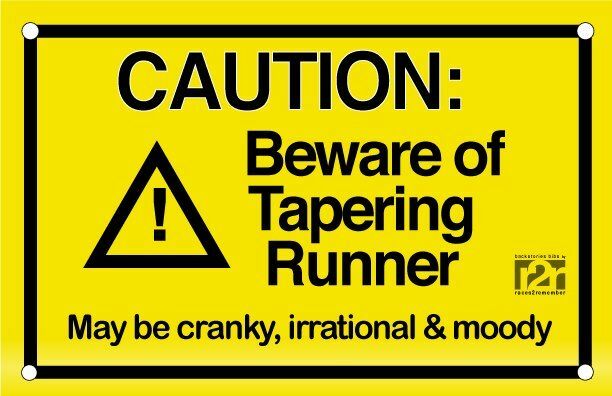 Although I do believe the tapering process will differ not just for every person but also for every race, there are definitely some key essentials that can be helpful for anyone in taper mode. So here are some things that continue to be helpful for me and hopefully for you and your next race as well. Regardless of your training program, one thing is certain, you will need to decrease your mileage and intensity in the last few weeks leading up to your big event. You do this to ensure you have fresh legs and are not over trained come race day. If you’re like me and a big fan of hitting the weights, swimming, spinning, etc., you will want to apply these same principles to your cross training. Those last couple of weeks before your half or full marathon is not the time to max out or try a new intense workout routine. Your muscles need time to regenerate post workout and this can take several days. While your muscles are working hard to rebuild, you may experience soreness, feel tired and have decreased range of motion, all of which can effect your running from form to stamina. Now, I am a huge fan of going hard in the weight room and continue to do so all throughout marathon training. But as my event approaches, I start to scale back, especially with lower body exercises to ward off soreness as well as decrease the risk of injury. You certainly don’t want to be insanely sore, or worse, hurt come race day! Being sore and tight on the day of your race can not only lead to sub par performance but can also hinder your recovery. Tight muscles often lead to weak muscles, so it is important that you are proactive about keeping your muscles loose and your joints limber. Foam rolling, dynamic stretching and yoga are staples in my marathon training, especially as race day approaches. Do not wait until you are stiff and sore to work out tight muscles, but sure to engage in some form of fascial release on a regular basis all throughout training and even more so as the race approaches. Investing in a foam roller is a great place to start, you can even do it in the comfort of your own home. It will also be your best friend post race when those muscles are pretty unhappy with you. We have all heard about carb-loading and increasing your caloric intake leading up to the race. This can, however, be a little misleading. I’ve made the mistake in the past as seeing this as an opportunity to eat everything in sight to prepare for race day. Pizza, chips, beer, anything I figured could pre-fuel my body for the big event, I devoured. Yes, your body will need some additional carbs, salt and calories to run for that amount of time, but it will need it in a healthy way. Unhealthy, processed foods will give you extra calories and carbs, no doubt, but these foods lack the essential nutrients to support your race day needs. They can reek havoc on your digestive system, cause gastric issues and effect your energy levels. Be sure to stick with real, whole foods such as lean proteins, whole grains and fruits and vegetables. Increase your carb in take with good carbs such sweet potatoes, quinoa, oatmeal and bananas. Add a little extra salt (I prefer pink Himalayan salt) to your food the day or so before your race to help with electrolytes. And be sure to drink extra water, you will want to be well hydrated heading into the event. Also, the last few days leading to the race is not the time to introduce new foods into your diet. You do not want to risk any sort of reaction from new cuisine that can effect your body on race day! It happens, I can attest to that. You put in months of training, you are ready to go out and crush your race and then BAM, you wake up under the weather! Sometimes it is just inevitable, we get a cold, or the flu or a stomach bug, etc. We have been putting our bodies through so much stress over the past few months that we end up being more susceptible to catching whatever may be “going around” as the saying goes. But just like stretching, you do not want to wait until it is a problem to do something about it. Be proactive when it comes to your immune system. Here are a couple of ways I like to help build up my immune system. As tempting as this may sound, it is obviously just not possible, hehe. But as a precautionary, it may not be a bad idea to refrain from any new activities as well as ones that you may be used to but could post a potential threat to your body. I know this may sound a little silly and actually pretty obvious, but it is a good reminder to not get too creative with your workouts and extracurricular activities right before your marathon. You will have plenty of time for adventures post race, so schedule your activities wisely beforehand. I guess your sky diving and swimming with the sharks will just have to wait a bit. Whether this your first long distance event that you’re just hoping to finish within a certain time frame, or you have a done this before and have a major PR in mind, it is important to not only have a goal, but to visualize yourself accomplishing it. The saying goes “The body achieves what the mind believes.” Your nerves will be all over the place leading up to the race. You don’t want them to get the best of you so it is important to keep your eye on the prize. Having a strong mental game will not only keep those nerves at bay but will also be what you need to turn your dream into a reality. Close your eyes and visualize yourself crossing that finish line. What does it sound like? Who will be there? What does it feel like? Imagine all of those things leading up the race and focus on how great it will feel. Hold onto those feelings all throughout the race as well, especially when it becomes daunting, and trust me it will at times. But having that vision of what your own personal “victory” feels like will be what you need to get you through. Easier said that done, but very important. Sleep not only helps rest your body but your mind as well. When we lack sleep, and we are just not ourselves physically or mentally, it can effect everything from our mood to our immune system. All of which are important for being effective on race day. Finding time in our busy lives for some extra hours of sleep can be very tricky (especially if you’re like me and have small children who stay wake periodically throughout the night). But what you can consider doing is going to be 15-30 minutes early each night the week or so leading up to the race, and try sleeping in a day or two as well. The extra minutes of sleep will add up to a few hours and will hopefully help you feel rested come race day. You’ve spent the past several months of your life preparing for this one day. The early wake up calls, countless miles and hours of cross training. You’ve studied programs, read articles and talked to seasoned runners to gain knowledge, insight and motivation to do this. At this point, you have done all you can to prepare. You’ve done your miles, you put in the work, you are ready, whether you think you are not, you can and will do this. You just have to believe that and trust in yourself and your training. Committing to and training for a distance race is an accomplishment in itself. It takes a lot of dedication and sacrifice as well as stepping out of your comfort zone. You have done what you once thought to be impossible by simply signing up for the race and then tackling all the training that is involved to prepare for it. Knowing that you have already accomplished such an amazing feat before you even toe the line should give you the confidence to see you to the finish. When you start to doubt yourself before hand or even out on the course, think back to all the miles you have already done, all the long runs you have completed and how you have survived it all. You have done this before cumulatively in your training leading up to this event, and you can do it now on race day. Don’t for a second doubt yourself and your abilities, you have come this far and it’s time to go out and finish strong! Good luck and happy running! Coach Christina is a certified strength and conditioning coach, marathoner, mother of 2 young sons and along with her husband, own and operates CWSC Performance. When she is not coaching, running or spending time with her family, she is blogging about it all!